Chemical synthesis of oligosaccharides is important to organic chemistry because of the critical biological functions of carbohydrates. Unfortunately, no handbook has been published on the subject…until now. Volume 1: Disaccharides presents synthetic carbohydrate chemistry, lists the syntheses, and shows the route of each synthesis. 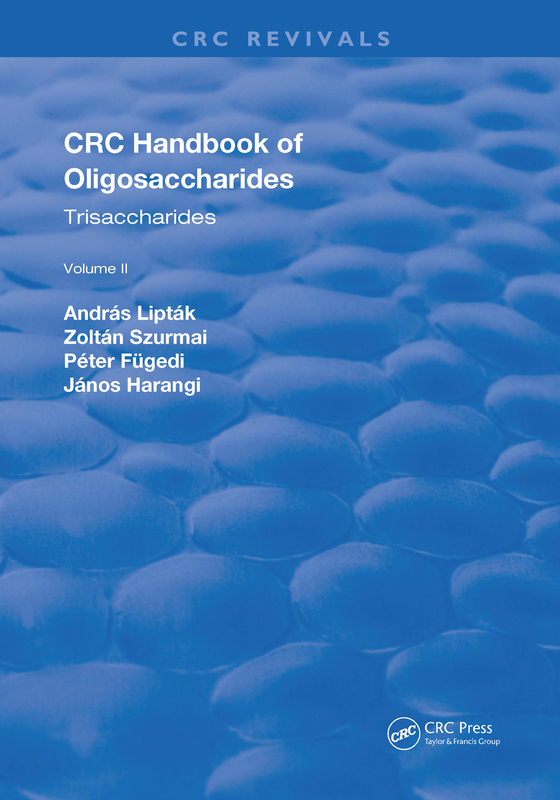 Volume 2: Trisaccharides presents schematic figures and references. This series includes all oligosaccharides synthesized between 1960 and 1986. This allows oligosaccharides prepared in their free form to be presented, as well as those produced in protected form. The series contains data regarding glycosylation reaction, namely reaction conditions (solvent, promoter, temperature), the aglycon and the glycosyl donor used, and the structure and physical data of the isolated product. For disaccharides, the names of the reactants and the products are revealed, while with trisaccharides and higher oligomers, schematic figures provide a quick and easy way to access information concerning the entire process. These volumes will provide an important reference source for biochemists, biologists, and organic chemists. Volume 2: Trisaccharides 2. How to use this book 3. Schematic figures 4. References.